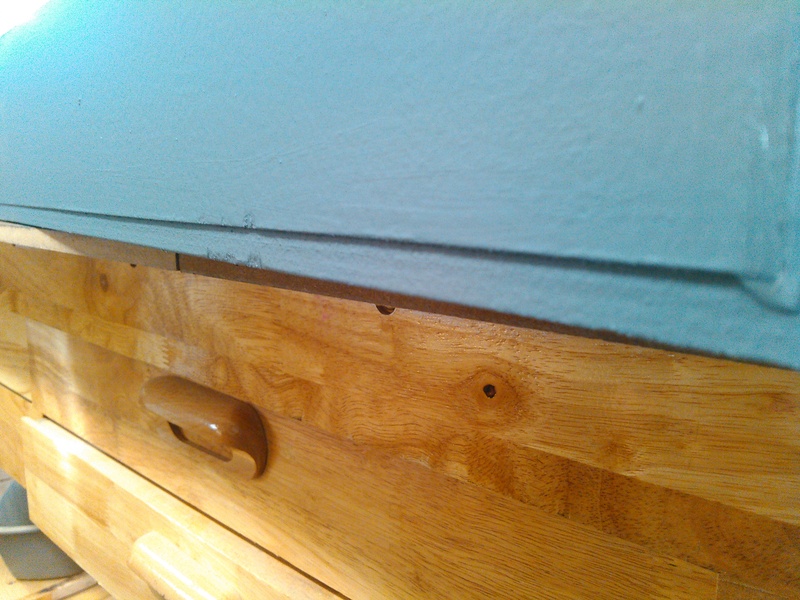 When I measured it, I discovered that the width of the edge recess was something like 0.485″, not .500″ which is the thickness of the MDF. I had everything set up right in Fusion 360 and the overall outside dimensions of the pieces were accurate. However, that recess was not. 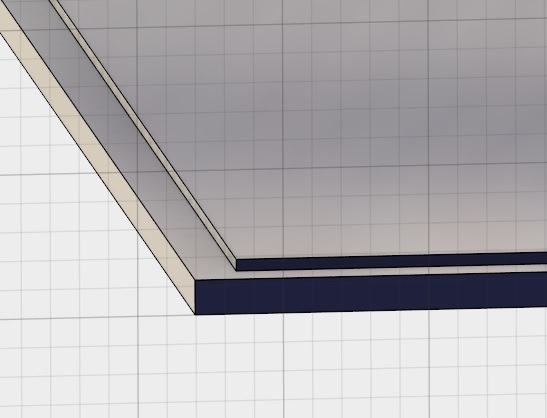 I went back and discovered that I had set the edge pocket clearing method to climb milling while the overall contour cut was set to conventional. Could this be a problem? I also threw in a 3rd factor: milling bit. 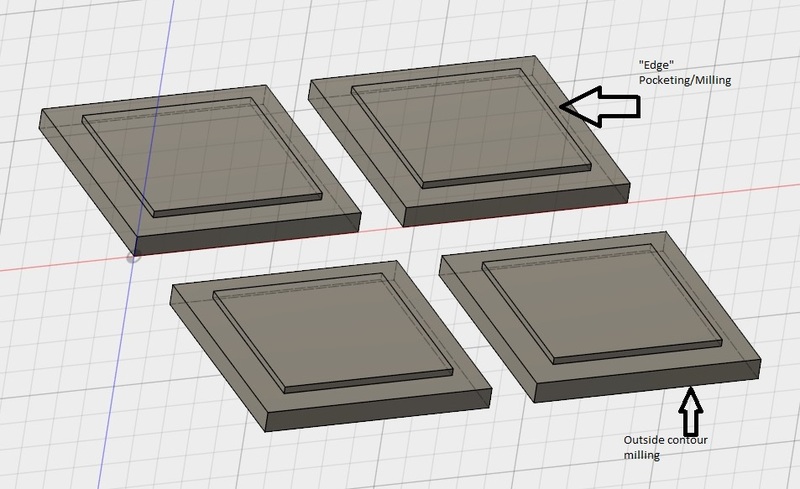 I ran one set of parts with a downcut bit and one with an upcut bit. I did this to see if bit selection had any effect. I then made a 3d chart of the data with the recess averages (of upcut/downcut measurements) plotted against “edge” climb/conventional cutting and “outside” climb/conventional cutting. Remember, “edge” is the recess that is pocketed out. “Outside” is the overall dimension. And here’s the interesting thing. When you use the *same* type of milling for both operations (climb/climb or conventional/conventional), the recess comes out to about 0.500″. However, if you use climb on the recess and conventional on the outside, the recess is too short. On the reverse, it’s too long. 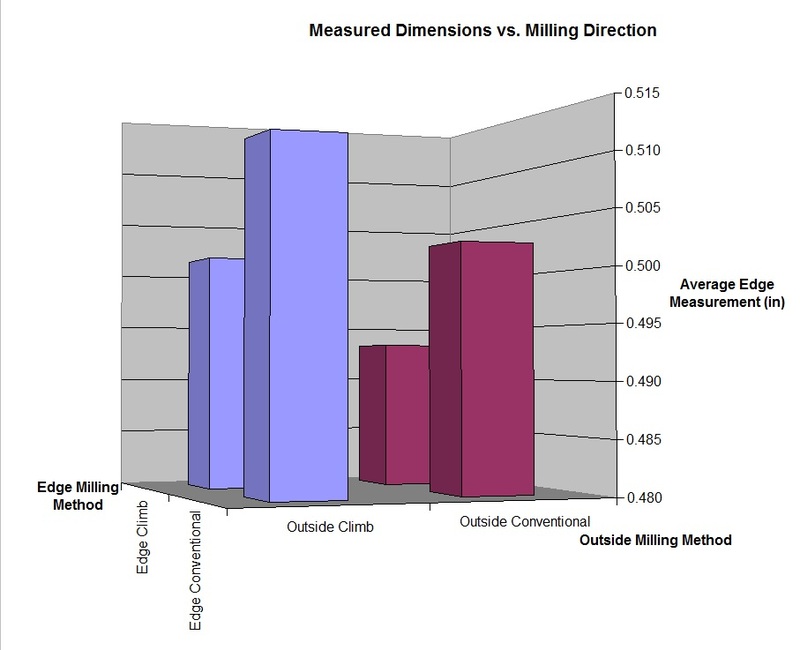 Looking at the averages, we can see that climb milling results in dimensions that are slightly too long. However, when climb milling on the edge is combined with climb milling on the outside contour, this error cancels out, and you get about a 0.500″ recess. The data also shows that there doesn’t appear to be a significant difference between upcut and downcut bits. I didn’t record values by machine axis. In other words, I can’t tell if a dimension was cut in the Y axis or the X axis. This may have an effect as there could be differences in the axes on the machine. I only did one run of each cut and only one measurement. There’s not enough data to run a statistical analysis to determine how significant this data is. I ran all runs at 180 in/min with a max depth of .125″ per cut. Obviously, chip loading, feed rate, etc. would all have an effect on the cutting. So why the difference? Well, if you think about it, in climb milling, the bit takes a small cut first which grows. In a compressible material like MDF or wood, it’s possible that the material gives a little and then flexes back. This would lead to material with a longer dimension. 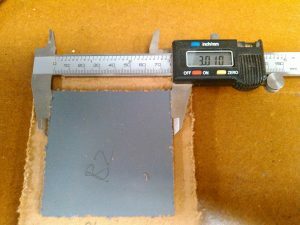 Whereas with conventional, the bit takes the largest bite first, which doesn’t give the material as much of a chance to compress. So, overall, use conventional milling on MDF. But if you don’t want to or can’t, make sure that for any important dimension that is affected by two (or more) cutting operations, you use the same milling convention.